Ed Perkins, vice chair of the Oconee County GOP, underscored the importance to Oconee County Republicans of what Gaines had said. “We all realize this is a special election, which means that it’s really all about voter turnout,” Perkins said. In the first week of early voting, turnout in both counties has been very low, but Oconee County is outperforming Clarke County in turnout both in the 117th and in the 119th, which is split equally between the two counties and has its own election on the ballot on Nov. 7. The Athens-Clarke County Federation of Neighborhoods is hosting a forum for all six candidates in the two races from 6 to 8 p.m. tomorrow (Monday) in the auditorium of the Athens-Clarke County Library, 2025 Baxter Street, Athens. The two candidates for the 117th will go first in the program. 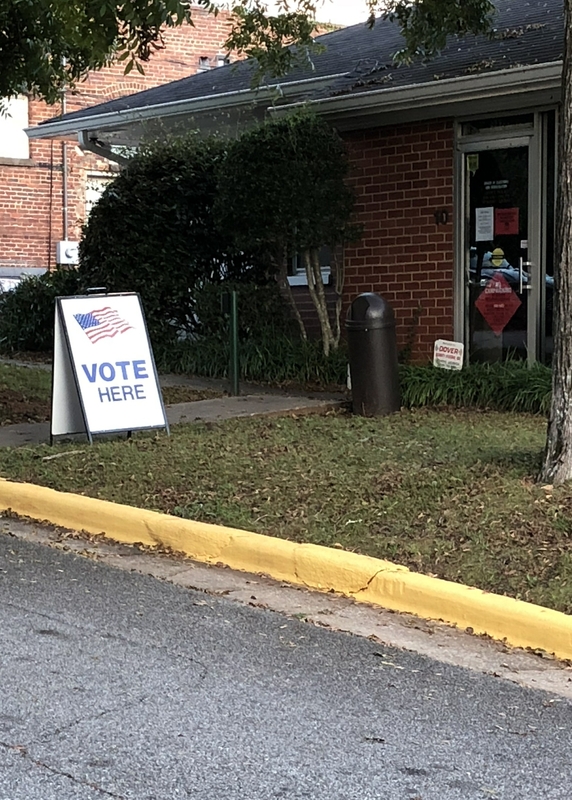 Only 618 Clarke County voters cast a ballot by 4:30 p.m. on Friday, the final day of the first week of early voting, according to Charlotte Sosebee, director of elections and voter registration for the county. According to the Georgia Secretary of State records, the county had 72,833 registered voters on Oct. 1. Final registration for the Nov. 7 special election closed on Oct. 10. Based on the Oct. 1 figures, the 618 voters represent just less than 0.9 percent of those who can cast a ballot either in the final two weeks of early voting or on Nov. 7. Early voting also will be possible from 9 a.m. to 4 p.m. on Oct. 28. Of Oconee County’s 27,428 eligible voters as of Oct. 1, 409, or 1.5 percent, went to the polls last week, according to Fran Davis, technical assistant in the Oconee County Board of Elections and Registration. Clarke County makes up 56.4 percent of the 117th House District, based on the Oct. 1 registration files from the Georgia Secretary of State’s Office. The database includes both active and inactive voters, or voters subject to purge because of inactivity in recent elections. Oconee County contributes 23.1 percent of the voters. 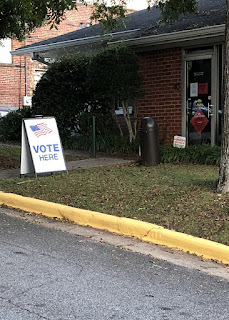 Based on the data for the first week of early voting, 271 of Clarke County voters were from the 117th, making up 1.3 percent of the 21,475 eligible voters. For Oconee County, 119 of the early voters were in the 117th, making up 1.4 percent of the 8,803 eligible voters. In the 119th, Clarke County had 173 of the 18,813 eligible voters turn out in the first week of early voting, or 0.9 percent. Oconee County had 290 voters cast a ballot last week, or 1.6 percent of the 18,625 eligible. As Perkins told the Oconee County Republicans at the Sept. 28 meeting, Clarke County has an advantage over Oconee County in terms of reasons for voting. Voters in Clarke County also are being asked to decide on a Transportation Special Purpose Local Option Sales Tax, and Winterville has contested city elections. In Oconee, the 117th and 119th races are the only ones on the ballot except in Watkinsville, where a single council seat is being contested. Yet turnout so far is just slightly higher in Oconee County. In the 118th House District, which falls entirely in Clarke County and which does not have a special election on the ballot on Nov. 7, only 174 of the 32,545 eligible voters cast an early ballot, or 0.5 percent. That 0.5 percent compares with the 1.3 percent turnout in early voting in Clarke County in the 117th and 0.9 percent in Clarke County in the 119th. Gaines finds himself in a race with Deborah Gonzalez, a Democrat, who is attempting to reestablish that party’s claim to the 117th. The district was reconfigured by the Republican controlled General Assembly in 2011 to make the district more Republican. Doug McKillip had been elected as a Democrat in what had been a traditionally Democratic district, but McKillip changed parties after being elected. During redistricting, three precincts in Oconee County–Athens Academy, Malcom Bridge and Bogart--were added to the district, along with parts of Barrow and Jackson counties. Quick defeated McKillip in the 2012 Republican primary, and the district has not had a Democratic challenger since. Prior to the 2011 redistricting, all of Oconee County had been in a single House District, and the precinct divisions are pretty meaningless to most voters. In fact, campaign signs for the current campaign seem to ignore them. Three Republicans, all from Oconee County, are running against each other and against a lone Democrat in the special election for the 119th. Republican Chuck Williams stepped down from the seat after being named at the end of the summer as director of the state Forestry Commission. 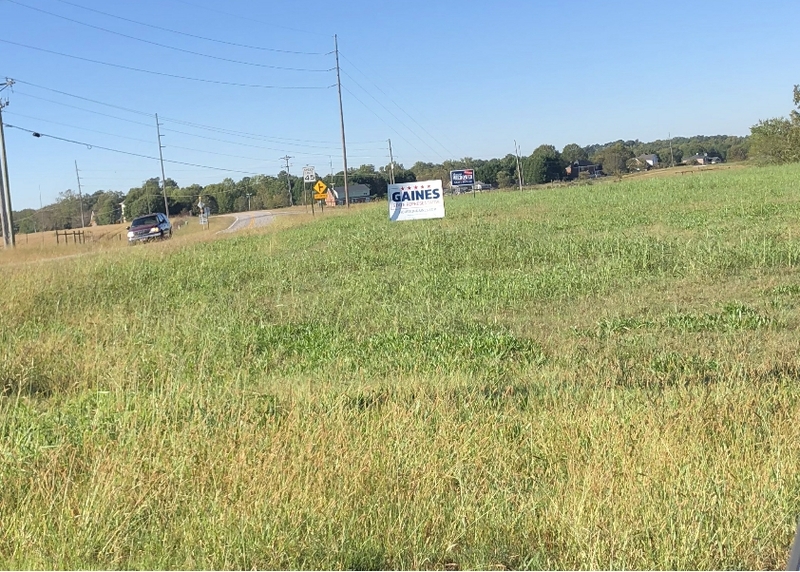 On my way down U.S. 441 from Hog Mountain Road to the Clarke County border last week, I observed signs for Tom Lord and Marcus Wiedower as well as for Gaines. The area is solidly in Gaines’ district, though it is a high traffic area for much of the county. 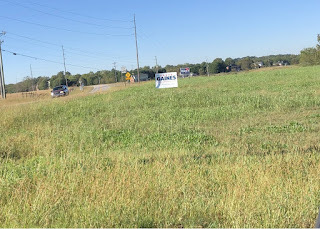 At the northwestern corner of Hog Mountain Road and Daniells Bridge Road, another high traffic area, Gaines and Wiedower have signs, though that property is in the 119th, which Wiedower, but not Gaines, is contesting. The third Republican is Steven Strickland, and the Democrat, also from Oconee County, is Jonathan Wallace. Democrat Wallace most likely will need a strong showing in Clarke County to make it to an almost certain runoff in the 119th. If no candidate gets more than 50 percent of the vote, the top two voter getters will meet again in December. The analysis I did of the demographic differences between the counties that make up the 119th as well as the 117th shows that, consistent with its history, Clarke County is likely to be more favorable to the Democratic candidates on Nov. 7. Barrow County contributes 9.1 percent of the registered voters to the 117th, and Jackson County contributes 11.3 percent. Parts of Statham fall into the 117th, and the city has a contested election on the ballot on Nov. 7. Barrow County also has a renewal of its Special Purpose Local Option Sales tax on the Nov. 7 ballot. Jackson County voters have no reason other than to vote in the 117th to bring them to the polls on Nov. 7. That is what Oconee County is so important to Gaines in terms of turnout. Williams never had Democratic opposition in the 119th, which also became much more dependent on Clarke County voters in redistricting than its predecessor district was. Clarke had 50.3 percent of the registered voters on Oct. 1, with the remaining 49.7 percent in Oconee. Russell Edwards, an Athens attorney who is past chair of the Athens-Clarke County Democratic Committee, has emphasized the possibility of Democratic success in both the 117th and 119th in public comments he has made, referencing the 2016 Presidential election vote. I asked Edwards for the source of his data, and he directed me to a publicly available, national data file on vote by legislative districts that is on the web site of Daily Kos, which labels itself as a liberal medium. No similar data file is publicly available on the Secretary of State web site, but I was able to compare the Daily Kos figures with those for Oconee County. The match was perfect. The data show that President Donald Trump got 49.4 percent of the vote in 2016 in the 117th, compared to 46.1 percent for Hillary Clinton. The Trump percentages for the parts of the district from the four counties were: Barrow, 69.6 percent; Clarke, 33.8 percent; Jackson, 73.4 percent; and Oconee, 64.8 percent. In the 119th, Trump got 51.1 percent of the vote, compared with 43.9 percent for Clinton, but the percentage for Trump in Clarke County was 30.8, and in Oconee County it was 68.5. In the 118th House District, Trump got only 23.9 percent of the vote, compared with 72.3 percent for Clinton. The data confirm that redistricting made the 117th more Republican, but the advantage for Republicans is slight, making turnout so very crucial on Nov. 7. That was the message Gaines and Perkins gave the Oconee County Republicans on Sept. 28. Back in January, I purchased the publicly available registered voter file for Oconee County from the Secretary of State Office so I could examine who are those most likely to turn out in elections. In my analysis, I eliminated those who had not registered by the beginning of the March Presidential Primary. I also eliminated those who have been labeled as inactive because they have not voted recently. I then created a score for each of the four elections held during the year: the Presidential Primary in March, the primary elections in May, the general election in November, and the runoff in December. Each vote was scored as 1, so each voter could have a score of from 0 to 4 for the year, depending on the number of elections in which she or he voted. I only got around to doing the analyses of the data last week, and they show that the overall score on the voting total for the county was 1.84. In percentages, this means that only 10.4 percent of the county’s voters last year voted in all four elections. Young voters had a lower voting score than older voters. Those born 1997 and 1998 had a score of 1.29. Those born 1946 or earlier had a score of 2.32. Female and male voters didn’t differ in terms of their vote score. White voters had a much higher score than all of the other racial and ethnic groups. The score for White voters was 1.83, compared with 1.14 for Asian and Pacific Islanders, 1.3 for Black Non-Hispanic voters, and 1.3 for Hispanic voters. Precinct also made a difference. Overall, as noted, the score on the voting measure was 1.84, but it was 1.73 in Bogart, one of the three precincts in Oconee County that falls in the 117th. It was 1.88 in Malcom Bridge, or just a bit above the average, and 1.92 in Athens Academy, or considerably above the average. At the candidate forum on Oct. 9, one of the citizens asked Gaines and Gonzalez about gerrymandering, or the creation of districts for the gain of the politicians. Gaines said the General Assembly should address the problem. 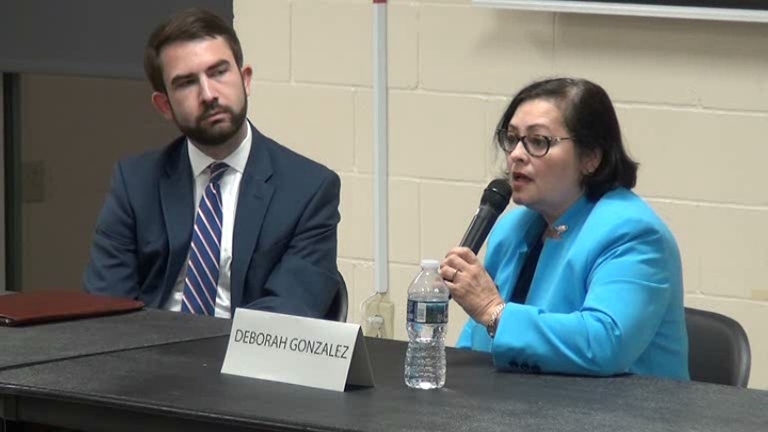 Gonzalez said the state needs an independent redistricting commission, since both parties have been guilty of redistricting. The 2011 gerrymandering of the 117th and the 119th is front and center in the Nov. 7 special elections, as Gaines and Perkins told Oconee County Republicans in late September, though neither used the word. Gerrymandering is a factor in elections, but it seems like the more important factor is voter turnout. The voters who turn out get to choose the representative they want. Nonvoters are nonfactors. Don't complain about government if you don't vote.